Who's right, the internet or my eye Doctor?? "Pirates wore eye-patches so they could have one eye already dilated when they go down inside their ship so they could see in the dark better, not because every pirate had their eye shot or stabbed." Sounded pretty wise, and I shared it with my ophthalmologist, who debunked it, saying that both eyes would dilate. If Abe Lincoln wrote it on the interweb, go with him. Get an eye patch and test it. Your doc is right... Same reason why you don't squint or close one eye when shooting.. If you squint one eye, both eyes dilate which destroys your fine detail vision so the front sight isn't sharp any more. If you have syphilis or perhaps Multiple sclerosis you might have the ability to dilate or constrict one pupil different than the other. Otherwise, the internet is never wrong. Your eye doctor didn't "didn't spend six years in Evil Medical School to be called mister..."...or be challenged by the internet. pirates wear an eye patch to protect the eye from the parrot. pirates have parrots, because , of course, these were a huge chick magnet , back in the day. Eye Doctor is wrong. Covering an eye during the day makes that eye work better at night. Them pirate just switches the patch to the other eye once it's dark. Voila, instant night vision! If I got a parrot would he have to abide by the restraining order Stringle put out on me?? I can see better when I squint. If you want to cheat on an eye exam, you can look at the line you are supposed to read, then squeeze your eyes shut for a few seconds, and then as soon as you open them you'll be able to see a little clearer for a fraction of a second until your eyeballs resume their previous shape. I am curious about the pupil dilation though. I'm not disputing what you said, but adding that all professional life is, "continuing education". However, I tried it, and it seemed to work....at least a little bit better. What about you? There are a variety of reasons that pirates are said to have worn eye patches, but here are some of the most credible explanations. 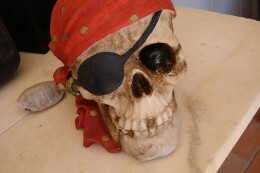 The patch was to cover an eye socket after they lost an eye in a pirate battle. Wearing the patch confused and threw off enemies, who believed them to be disabled or not quite on their game. Since pirates often fought both in the dark of a ship's hold as well as in the light on deck, wearing an eye patch would allow them to remove it in the dark and not have to wait for their eyes to adjust to the lack of light - meaning they wouldn't be easily snuck up on in the dark of the ships bowels. Young pirates would wear an eye patch as proof they'd been involved in a battle - since without experience it could be harder to find a suitable pirate company to join. 'n ye have a problem wit' that? So what is the purpose of covering one eye when looking at the eye test chart at the doc. Been to Disney World one to many times have we Captain Ron? ?